If you're looking for powerful performance, then consider the BMW M2 Coupe. This is a vehicle that is a part of the 2 Series and offers a little more power than the other two options that are available. The vehicle comes with a standard six-speed manual transmission. Several upgrades can be seen throughout the interior of the vehicle and under the hood. Visit Bert Smith BMW to have it tuned for the sport driving that you enjoy as there is 405 horsepower behind the engine. A dual exhaust system gives you the sporty noise that you desire. It also enhances the airflow through the vehicle and the performance while retaining quality fuel efficiency. Performance seats are standard so that you can drive in luxury while in Saint Petersburg. 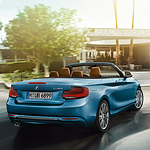 Since the balance of weight is evenly distributed throughout the vehicle, you'll find that handling is improved in the BMW 2 Series.